It’s Jazz Week here at The Retro Set! Put your glad rags on while we cut a rug, because from August 3rd through August 8th the Retro Set is diggin’ the swingin’ beat of some of the greatest jazz musicians in history as we look at the role jazz plays in film. 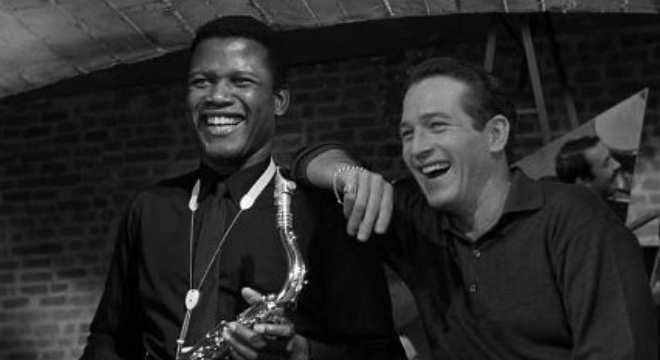 Today guest contributor Bobby Rivers takes a personal, poignant look at the 1961 drama Paris Blues starring Paul Newman, Sidney Poitier, Joanne Woodward … and Louis Armstrong. A jazz music legend hit a high note in a 1961 movie that had some solid social commentary. “Honey, I live music. Morning, noon, the whole night. Everything else is just icing on the cake. You dig?” So states Ram Bowen, a young man with a horn played by Paul Newman in Paris Blues, is just too damn cool. The same goes for his best friend and fellow jazz musician, Eddie Cook, played by Sidney Poitier. I so dig this film. 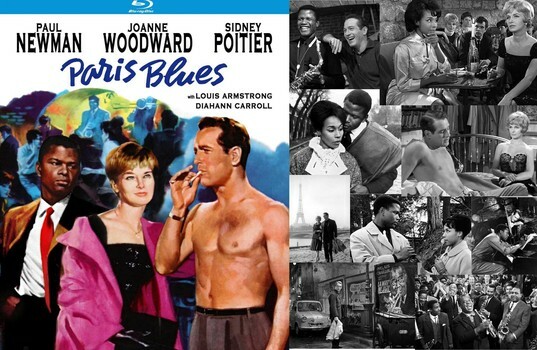 Paris Blues was directed by Martin Ritt and he seemed to distill the essence of Newman to make the actor a movie star (The Long, Hot Summer in 1958) and then elevated him even higher to Oscar-nominated film icon (Hud in 1963). When discussing the top films of the individual stars, Newman and Poitier, this film usually doesn’t get mentioned, but it’s one of my favorite Paul Newman movies as well as one of my favorite Sidney Poitier movies. Paris Blues has a demitasse of a plot. We’ve got four Americans in Paris – two jazz musicians living in the city of light and two girls on vacation. All four are away from the oppressive racism back home in the States, especially the two expatriate jazzmen. Will the two ladies take their new-found loves back to America? This romantic drama is light on story but offers a new beat, a new rhythm, a new composition for the United States to consider – like the one Ram labors to write. Ritt set this rhythm right at the beginning. No opening credits. Instead, up comes Ram Bowen hitting a hot note in his swingin’ jam of Duke Ellington’s “Take the A Train.” (Ellington would get an Oscar nomination for Paris Blues in the category of Best Original Music Score.) Newman and Poitier are established as the hip headliners on stage in the packed club. This is a club where everyone is accepted; no one is an outcast. The camera moves around the club to show the couples. A white man puts his arm around his black lady friend. There are young people. Old people. Slim people. Hefty people. There’s racial diversity on the dance floor. At the bar, we see sexual diversity as a very lovely lesbian couple gets affectionate. Near them, a gay male couple enjoys the jazz. All are united in the love of the music. Those opening two minutes were very bold for 1961 when segregation was still rampant. Black Americans were fighting for civil rights – like the right to vote and the right to an education. Interracial marriage was illegal in some states. Hollywood itself was still timid about racial equality. Rarely, if ever, did moviegoers see interracial friendships between lead characters played by Hollywood stars. Ram and Eddie were best friends and artistic collaborators who could occasionally work each other’s last good nerve. The single ladies on holiday in Paris are a school teacher (Diahann Carroll) and her divorced best friend (Woodward). Movie audiences got another beat of Martin Ritt’s rhythm stick when Connie (Carroll) makes her entrance. Connie’s French is a little rusty. Ram helps her get a message across to the train porter. She’s waiting for her girlfriend. When Ram replies, “Your girlfriend as pretty as you are?”…wow! Yes, he flirts with a black woman. In public. In broad daylight. This was a new composition for a Hollywood scene. Connie is more interested in Ram’s friend and musical arranger, Eddie. Her divorced gal pal falls for Ram. Eddie is weary of America’s racism and likes the acceptance he gets in France. Connie feels talented Eddie shouldn’t turn his back on the U.S., especially when it’s on the verge of new freedoms and changes for black people. That relationship gives Paris Blues a bass line. Paul Newman and Sidney Poitier – two men with Best Actor Oscar nominations to their Hollywood history. Joanne Woodward and Diahann Carroll – two women with Best Actress Oscar nominations to theirs. 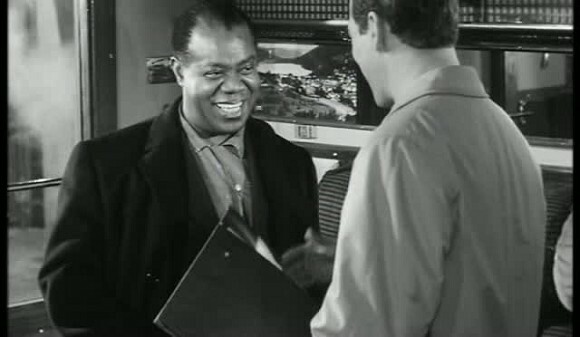 Another star in this film is jazz legend Louis Armstrong. Playing international jazz great “Wild Man” Moore, Paris Blues gives Armstrong the best acting role he’d ever had and it was the first role fully to treat him with the respect he deserved. Fans, black and white, run to greet “Wild Man” as his train arrives. Ram hopes “Wild Man” will have time to look over his new composition and tell him if it’s good. In the marvelous and fascinating documentary film, Jazz by Ken Burns, much time is devoted to Louis Armstrong. His work, talent and achievements are explained and analyzed. He is rightfully called a “genius” in the art of jazz with extraordinary work going back to the 1920s. Armstrong’s genius put him on stages here in America and on tour in Europe in the 1920s. His first appearance was in 1936’s Pennies from Heaven thanks to friend and fan, Bing Crosby. Crosby insisted that Armstrong get prominent billing. This was long before Hollywood embraced racial equality. Armstrong was a specialty act in Paramount’s Artists & Models (1937). He and Martha Raye give the movie true life with their “Public Melody Number One” Harlem-flavored number. Hollywood under-utilized Armstrong in the 1930s and 40s. He had a natural screen charisma and, besides his jazz artistry, he could handle comedy dialogue quite well. 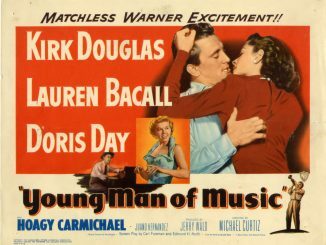 He should’ve had the same quality of movie role opportunities that fellow jazz musician Hoagy Carmichael got in To Have and Have Not (1944) and The Best Years of Our Lives (1946). But Louie mostly played himself and did specialty numbers. Paris Blues also swings us with music by Duke Ellington. The musical highlight in the film is the “Battle Royale” jam session. Armstrong’s character makes a surprise appearance and a fabulous entrance at the club to musically tease his buddies into a friendly jazz challenge. When we see Ram and Eddie’s expressions, we know we’re in for a good time. 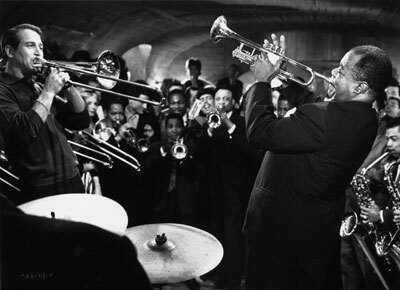 Director Martin Ritt showcased Louis Armstrong for what he was in the movie and in real life – a beloved jazz icon. He’s not a sidekick. He’s a superstar. 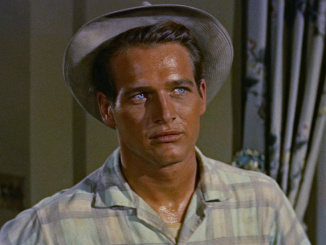 In Armstrong’s serious scene with Newman, he’s presented as a dapper and intelligent gent, a classy showbiz veteran artist who knows the craft of jazz music and has not been seduced by fame. It makes you wish Hollywood had given “Satchmo” more dramatic characters to play instead of mostly specialty numbers in which he played himself. He was terrific as himself, don’t get me wrong. I loved seeing him look sharp in Howard Hawks’ A Song Is Born, a 1948 musical remake of his Ball of Fire that starred Barbara Stanwyck, and in 1951’s The Strip in which Armstrong sang “A Kiss to Build a Dream On” to a Best Song Oscar nomination. But it would’ve been great to see Armstrong get something like fellow jazz artist Dexter Gordon did. A top saxophonist from the 1940s to 1980, Gordon got one feature movie role in his career. He played a talented but troubled jazzman similar to his real self. For his performance as Dale Turner in ‘Round Midnight, Dexter Gordon became an Oscar nominee for Best Actor of 1986. When I was youngster in Los Angeles, Louis Armstrong beat The Beatles in the 1960s. The Fab Four held the number one spot in the Billboard charts for several consecutive weeks. Then the record of Armstrong singing “Hello, Dolly,” the title tune from a new hit Broadway show, came out and topped the charts in 1964. He sang, he played trumpet, he won a Grammy for his huge record hit. A few years later, Mom took me to see Hello, Dolly! The spare-no-expense 1969 movie version of the Broadway hit played at Grauman’s Chinese Theatre in Hollywood. When Louis Armstrong appeared on screen in the big title number to sing with Barbra Streisand, the movie audience broke out into cheers and very enthusiastic applause for the legendary jazz musician. And that’s just what Louis Armstrong deserved. Bobby Rivers is an American television, radio personality and actor. He writes about his abiding love for classic film at BobbyRiversTV.